German author; born at Frankfort-on-the-Main July 15, 1862. He studied German philology and philosophy at the universities of Berlin, Leipsic, and Heidelberg (Ph.D. 1883). After a short stay in Frankfort, he went in 1884 to Munich, where he became acquainted with Paul Heyse, who exercised a strong influence over his writings. Since 1888 Fulda has lived in Berlin. 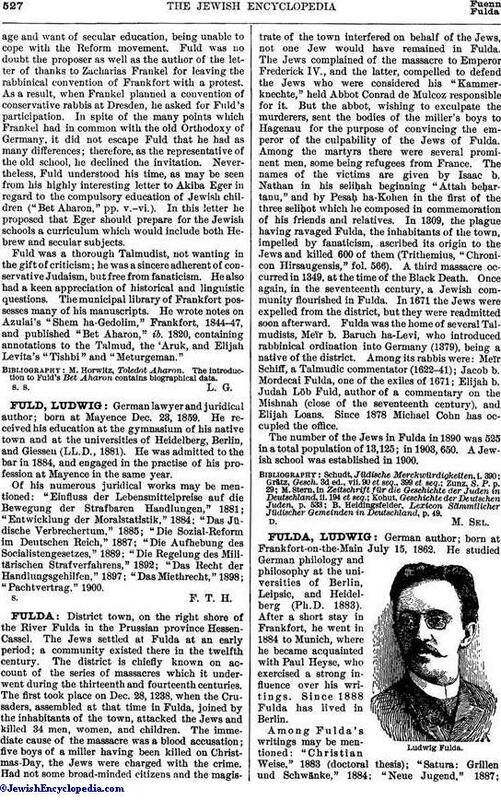 Among Fulda's writings may be mentioned: "Christian Weise," 1883 (doctoral thesis); "Satura: Grillen und Schwänke," 1884; "Neue Jugend," 1887;"Lebensfragmente," 1892, 2d ed. 1896; "Lästige Schönheit," 1897; "Neue Gedichte," 1900; the comedies: "Die Aufrichtigen," 1883; "Das Recht der Frau," 1884; "Unter Vier Augen," 1886; "Frühling im Winter," 1887; "Die Wilde Jagd," 1888; "Wunderkind," 1892; "Die Kameraden," 1892 (2d ed. ); "Robinson's Eiland," 1895 (2d ed. ); Jugendfreunde," 1897 (2d ed. ); "Ein Ehrenhandel," 1898; "Die Zwillingsschwester," 1901; the social dramas: "Das Verlorene Paradies," 1890, 2d ed. 1898; "Die Sklavin," 1892, 2d ed. 1893; "Die Zeche," 1898; the tragedy, "Herostrat," 1898, 4th ed. 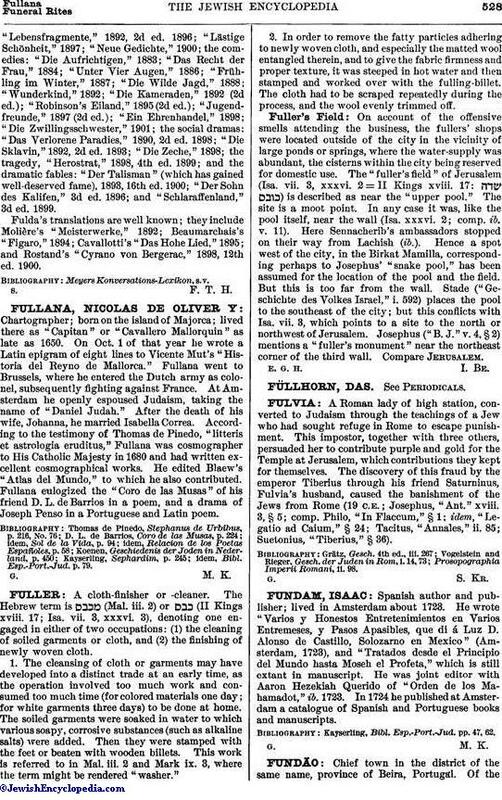 1899; and the dramatic fables: "Der Talisman" (which has gained well-deserved fame), 1893, 16th ed. 1900; "Der Sohn des Kalifen," 3d ed. 1896; and "Schlaraffenland," 3d ed. 1899. Fulda's translations are well known; they include Molière's "Meisterwerke," 1892; Beaumarchais's "Figaro," 1894; Cavallotti's "Das Hohe Lied," 1895; and Rostand's "Cyrano von Bergerac," 1898, 12th ed. 1900.